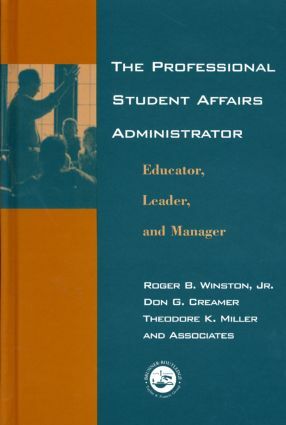 Styled as a complete update to the 1991 book "Administration and Leadership in Student Affairs", this work addresses issues of importance to student affairs professionals. Grounded in human development, learning, leadership, group dynamics, management theories, and social science research and evaluation methods, this book articulates the means for college student affairs administrators to function in the forefront of student learning and personal development initiatives. The book focuses on the three essential roles played by student affairs administrators: as educators who play a significant role in addressing the academic goals of their institutions, as leaders who help to shape the vision of their institution's student affairs practice and education mission, and as managers who are responsible for co-ordinating programs and services, supervising staff, and overseeing university facilities and budgets. 9. Finance and Budgeting, Dudley B. Woodward, Jr.